While the community college is a longstanding institutional type within the U.S., the success of this model has recently garnered international attention. As countries outside the U.S. grapple with issues regarding access and affordability of higher education opportunity, the concept of the community college has gained traction. 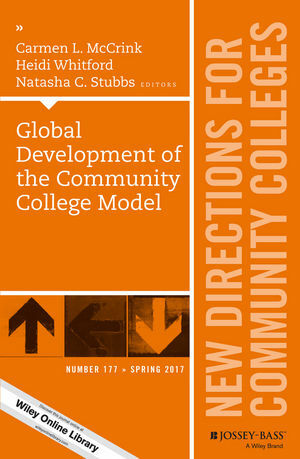 Case studies that focus on the development and implementation process of community colleges amid various social, political, and economic contexts. This is the 177th volume of this Jossey-Bass quarterly report series. Essential to the professional libraries of presidents, vice presidents, deans, and other leaders in today's open-door institutions, New Directions for Community Colleges provides expert guidance in meeting the challenges of their distinctive and expanding educational mission. Carmen L. McCrink is associate professor and chair of the Higher Education Administration Department at Barry University, Florida. Heidi Whitford is an assistant professor in the Higher Education Administration Department at Barry University, Florida. Natasha C. Stubbs is a doctoral candidate in the PhD in the Leadership and Education program with a specialization in higher education administration at Barry University, Florida. What elements influence the establishment of community colleges globally? This chapter examines the ability to develop an educated workforce via a differentiated postsecondary system. Outcomes of a partnership for a community college in Chile, based on organizational learning theory, are discussed. This chapter provides an overview of community colleges in Mainland China, current challenges, and future development. Factors that promote the persistence of Korean students enrolled in the Academic Credit Bank System are considered. This chapter outlines the postsecondary system in India, providing specific emphasis on the contributions of the community college. Tenets of the American community college are applied within the South African postsecondary context. A comparison of the completion agendas of community colleges and their global counterparts at the institutional and national levels are examined. A global perspective of the expansion of postsecondary education, inclusive of the commonalities and differences are described. Combining university and community college education to promote the economic growth of developing countries is discussed.